This green-on-green salad was inspired by St. Patrick's Day, but its fresh flavor & creamy dressing have made it one of my year-round lunch favorites. I have a very green, yet not very St. Patrick’s Day-themed recipe today. Maybe next year will be the year that I finally decide to revamp the shamrock shake (why don’t I think of these things earlier?). But for now, I’ve got green-on-green-on-green. Kale, brussels sprouts and avocado…. with some other veggies tossed in for crunch and a pop of color. 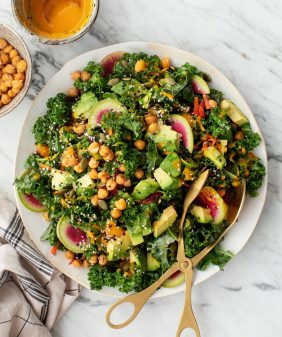 The trick to raw kale salads is usually to massage the kale – this time I just chopped the leaves really small, mixed them with shaved brussels sprouts, and tossed it all with a creamy avocado tahini dressing to help wilt the hearty greens. Consider this one your post-St. Paddy’s day detox. Place avocado, tahini, lemon juice, garlic, and olive oil into a food processor. Pulse, then add water salt and pepper and blend until creamy. 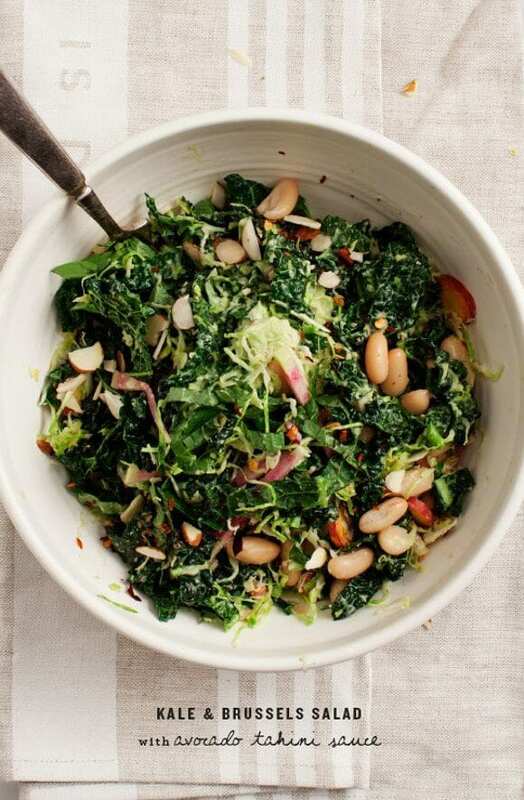 In a large bowl, toss the kale, brussels sprouts, radishes and carrots with half the dressing. Mix well, then let it sit at room temp for about 15 minutes. Add white beans, almonds, basil and as much of the remaining dressing as you like. Taste and add more salt, pepper, and lemon juice as needed. I think you just put all of my husband’s favorite things into one salad (well, except for bacon). Sounds delicious! This will definitely have to get made. Now that looks good!!! Winter meets Spring! Tom. That looks so delicious and as usual, so packed with vitamins! This is a great, high energy lunch! I can’t wait to make this salad. This is perfect for this time of year and all the textures look so good together. This looks lovely! I love your avocado salad dressing! So brilliant. Just had my annual homemade Shamrock Shake and desperately need a detox already. Thanks for posting this! Dinner? Done. I know most of the readership is vegetarian here, but wouldn’t this just make the perfect side for some Texas style BBQ? 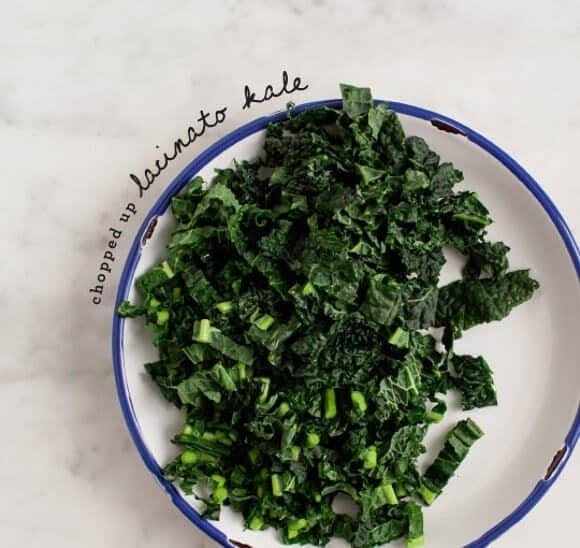 Chopping kale into small pieces is a good tip for preparing kale! I also like the sound of the dressing. It’s a nice way to use an avocado that one might have opened a bit too early. That’s amazing. Thanks for the easy, healthy recipe. I am going to try it now. I’m totally down for this green on green on green action! That salad looks amazingly refreshing! The dressing sounds lovely! 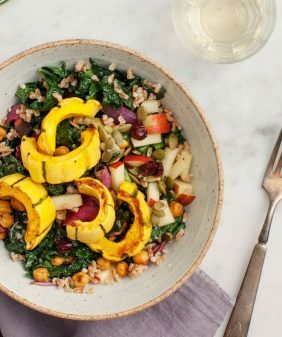 We are thinking along the same lines this week with our kale salads. 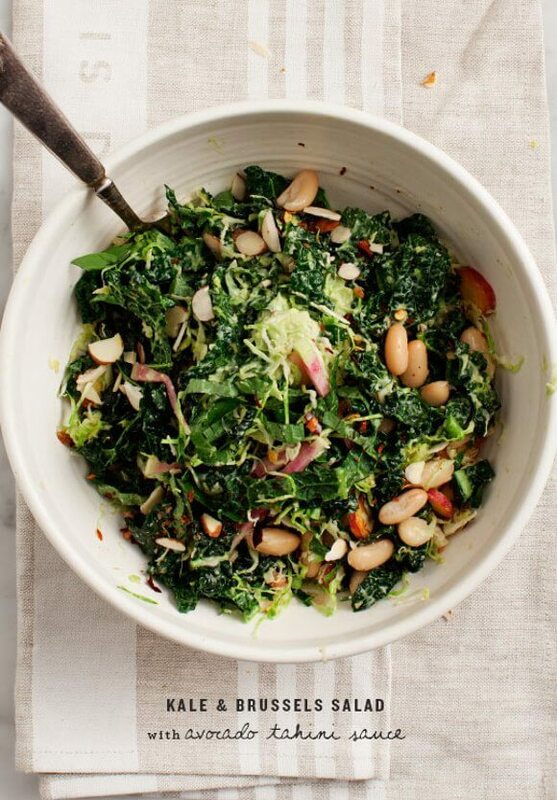 The white beans and Brussels are a great addition, they turn this salad into a meal. 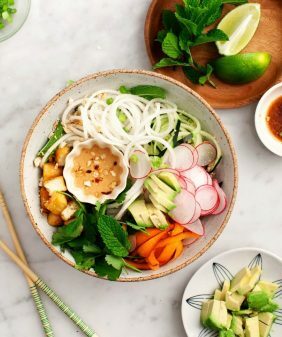 And I love your avocado tahini dressing…make something similar often for lunch bowls and can’t get enough! I have tahini in the fridge to use up and think I know what I’ll use it for now! Great salad, and yes, you’re spot on with the St. Paddy’s Day Detox idea. This looks so lovely and delicious. I made this one to take to the office for lunch. I works perfectly in the sense of not weighing you down after. And even served well for alertness for my technical drafting. I don’t know if it was all that kale, but kale is really good. In terms of this salad too. Delicious though I upped the pepper on it. 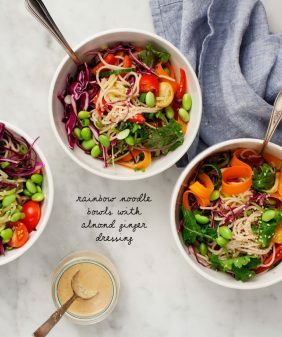 I just made this for dinner tonight and stayed true to dressing but added roasted cauliflour and chickpeas to the salad. It was delicious!! This was delicious. Very hearty and filling. I thought it could’ve used a bit more acid…lemon juice? Vinegar? But overall yummy! One of the yummiest salads I’ve ever made. The whole family loved it and I will be making again…and again…and again. Delicious! Hi Michelle, I’m so glad! I made this last night and it was a hit for me and my (ever-skeptical) boyfriend. I ended up telling him there wasn’t any left just so I could take the rest to work with me today. 🙂 Forgot the brussels at the store so I roasted some broccoli and cauliflower instead. Thanks – this was the first recipe I’ve made from your site! Thanks for the recipe. So glad you used tahini, since I have a big container of it. I didn’t have brussel sprouts and the salad was still great. Keep up the good work. This is such a delicious, satisfying, healthy entree salad! And makes awesome leftovers for lunch the next day. Thanks for the fantastic recipe! I just made this last night to have for lunch today 🙂 The sauce is amazing!!! I’ll definitely be making this recipe again. Just confirming the brussel sprouts are raw in this recipe? I think I’ve only eaten them roasted…FYI, I am serving this as the very green salad to compliment a “Garfield” lasagna (requested by my very sweet 6 year old). Yep, they’re raw. You’ll want to slice them thin (I often use a mandoline), and then the shreds become tender as they soak up the dressing. Although, I’m not sure if kiddos would love this one (I don’t have experience there – you’ll have to let me know). Where do I find tahini? Thanks for your quick reply! The only placed I’ve looked so far is Raley’s, in the Asian food aisle and also in the health food section. How long do you think this dressing will last? 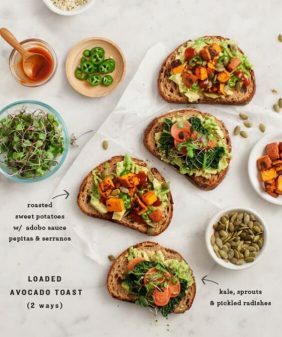 Could I meal prep this recipe for four days? Hi Kristi, It’ll defiantly last 2-3 days, 4 might be pushing it (the avocado might cause the dressing to start to brown). Let me know if you give it a try! 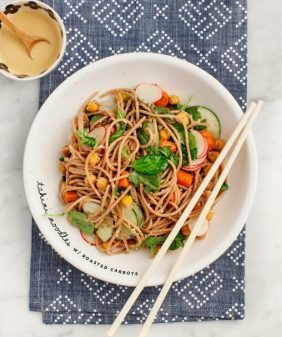 Mine did not taste like a five star recipe, but I added roasted sweet peppers, a tablespoon of tamari and a tablespoon of sesame oil and then I give it five stars ! Especially served with kale and baked tofu over brown rice and quinoa !!!! I’m doing the Whole30 and can’t have beans, but I love the concept and combination of all of the other salad ingredients. Can the salad stand on its own without the beans or can you suggest a legume- and grain-free alternative? Hi Susan, (sorry for my slow reply!) you can skip the beans and add in another protein if you like – it’s flexible! I am just starting to love Kale as a salad. I used to be all about the iceberg lettuce, but the natural benefits of Kale is huge and I really am starting to like the taste. I’ll give this recipe a go. Hi Clayton – I hope you like it! Can’t wait to try this! But how long do you think the dressing will last in a container in the fridge? Always the issue with avocado, and I live by myself so I want to maximize this dressing as I don’t think I will be sharing it with anyone! Thanks in advance! Hi Jess – it’ll only last about 2 days because of the avocado. You’d be surprised! I’ve found the addition of lemon or lime juice helps it to keep at least 4 or 5 days. It doesn’t turn brown, but it does become a lighter green. The best way to make it easy and fast. Tank you so much.